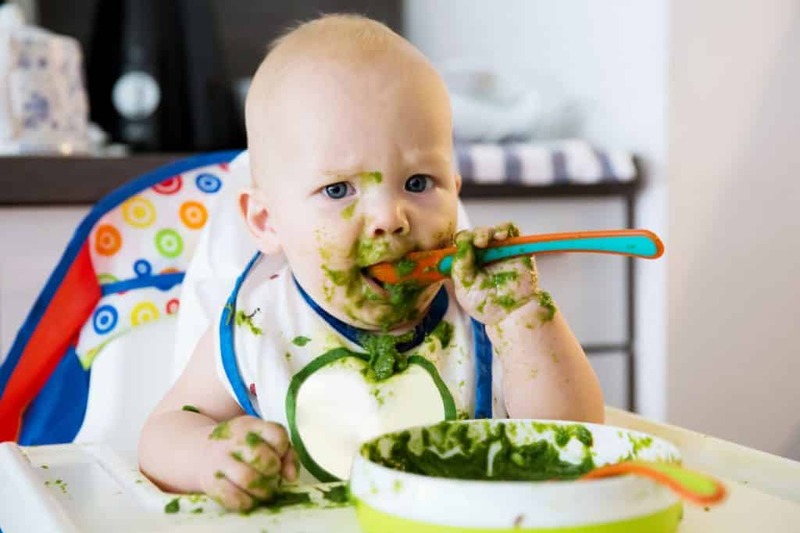 Starting those first foods comes faster than we can believe and before you know it, your little one is 4-6 months old and eyeing that steak on your plate, drool trailing our of their mouth. Well, it may be a few more months before they can down that T-bone, but per the Academy of Pediatrics recommendations, you can actually start first foods as early as 4 months. The most important thing to remember, though, is that foods for that first year of life are complementary, milk (breast milk or fomula) is a baby’s primary source of nutrition, and we are still aiming for 24-32 oz of milk daily (even with the addition of solid foods). Can he hold his head up in a high chair? Does she seem eager to feed or does she open her mouth up when food is coming her way? Can he move the food from the spoon into his throat and not just spit it back out? If you answered “yes” then get that bowl and spoon and bib . . . and lots of paper towels to clean up after! There is no right or wrong way to really start solid foods. The traditional way is to start with baby cereal (I, personally, recommend oatmeal) and then move to veggies and then fruits, but you do not have to follow this order. The most important thing to keep in mind is that each new food has to be introduced for 3 days before moving on to the next food to monitor for any possible allergic reaction (hives, lip swelling, vomiting, diarrhea). Last, but definitely not least, there have been some new recommendations on when to introduce eggs and peanut butter. We used to wait until after 1 yr, but after much research, they found a DECREASE in allergies if you introduced them earlier. So when you start proteins, please also introduce eggs (the white and yellow parts) and a small amount of peanut butter (add hot water to 2 teaspoons of peanut butter to make a warm puree. Put a little of this puree on the tip of a spoon and feed it to your child). You should NOT be introducing eggs or peanut butter if your child has severe eczema or food allergies, in that case they need to see an allergist first. Oh, and one more thing, there are really only 2 foods babies that babies can’t have until after 12 months: honey and whole milk.